Happy Friday! Today is the second of my new mini series called Easy Art in 1.2.3 : Abstract Diamonds. So often, I see art work that I fall in love with, but the price is more than I am willing to pay. In this series, I am going to go step-by-step on how YOU can make your own art work for a fraction of the cost! The first step in this piece of art is laying out the overall shape. Using a pencil, I roughly drew out two diamonds almost the entire size of the paper. 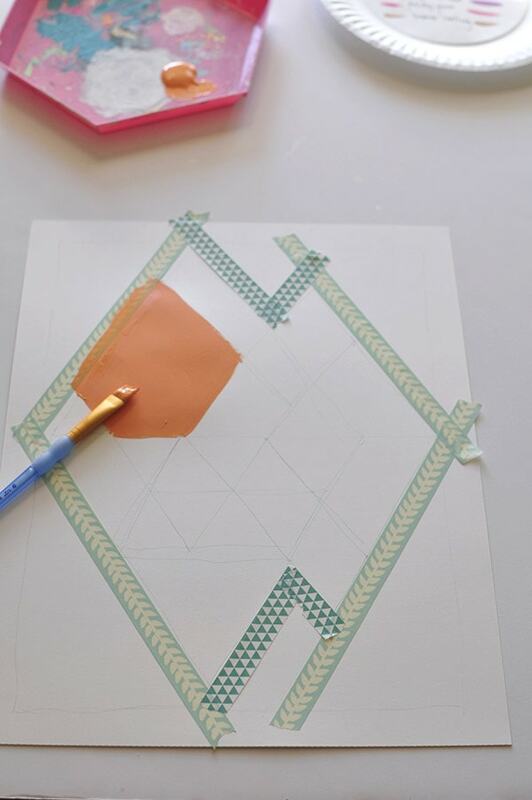 Then outline the diamond shapes with washi tape. This is to help give a crisp edge to your painting. 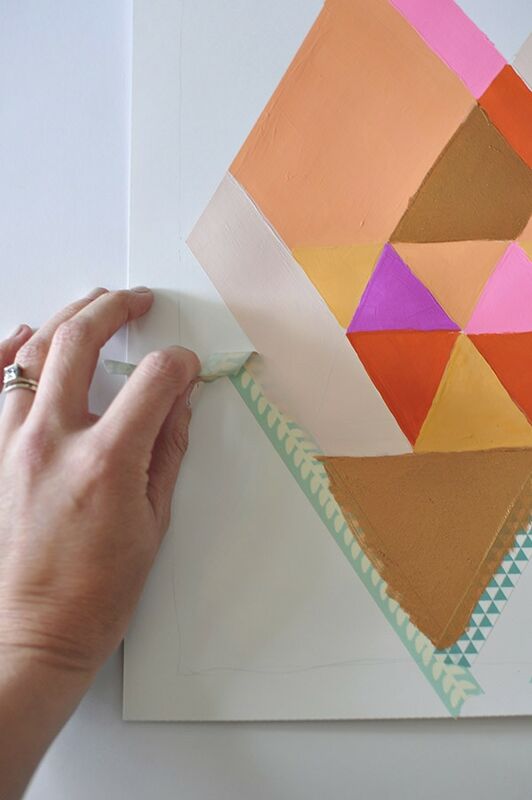 Once your main shape has been laid out, it’s time to create all the smaller diamonds and triangles that make this art piece unique. You can use a ruler, but as I’m sure you can tell, I just free handed mine. 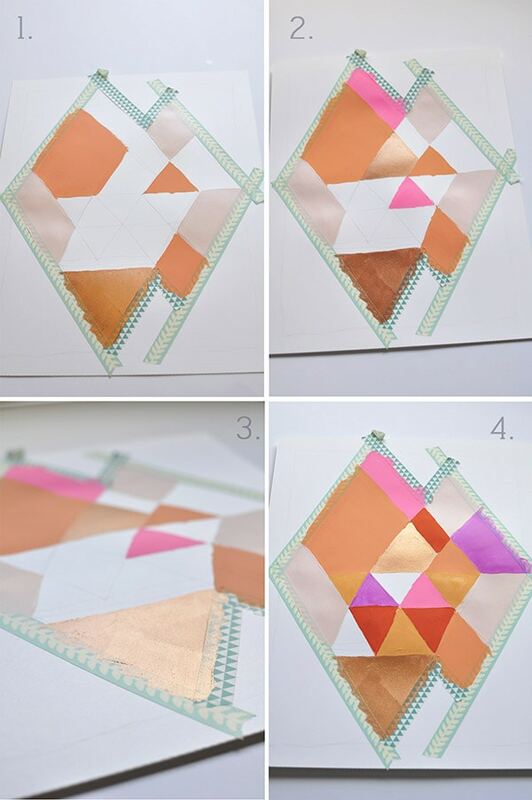 Then, start filling in each of the shapes one by one with your different paint colors. 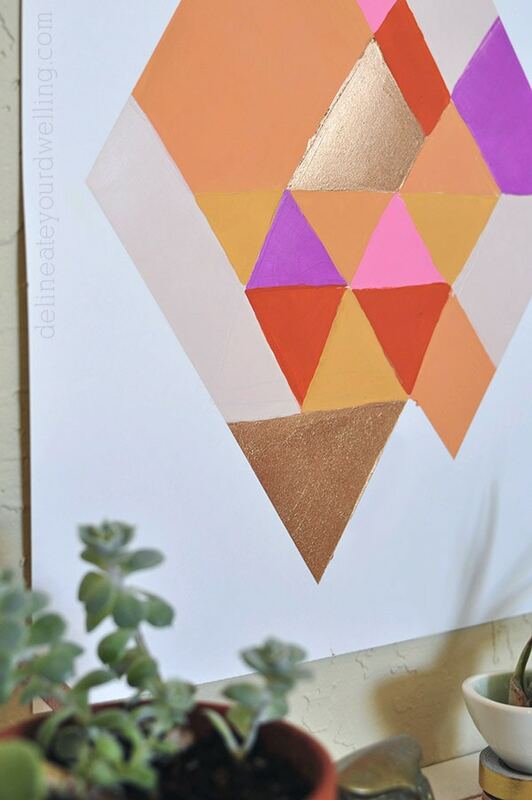 I just love how the bronze metallic paint added such dimension to the art work. Once your paint has dried, slowly remove the washi tape. I used a bronze foil paint and just love the reflective quality of it. 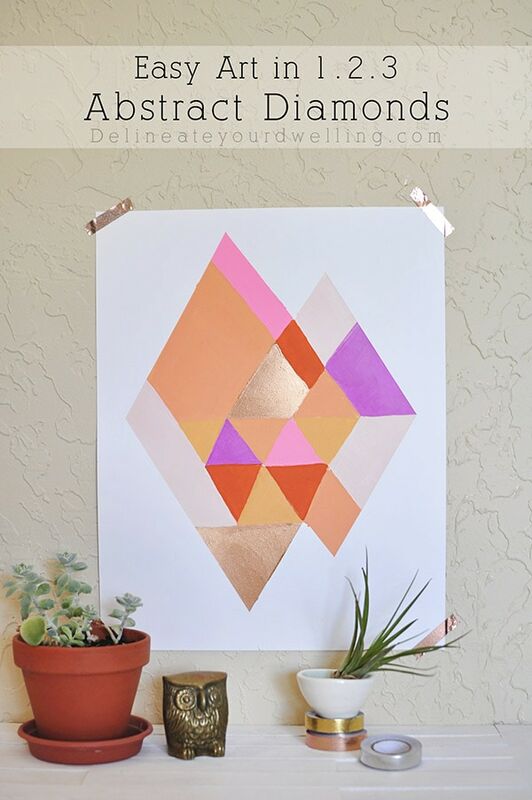 I am loving how this new colorful Abstract Diamond artwork turned out. I think it will soon have a new home in my office… but maybe first I will need to find a frame for it. You can see my other Easy Art in 1.2.3. posts here! You come up with such simple but beautiful diy art ideas! 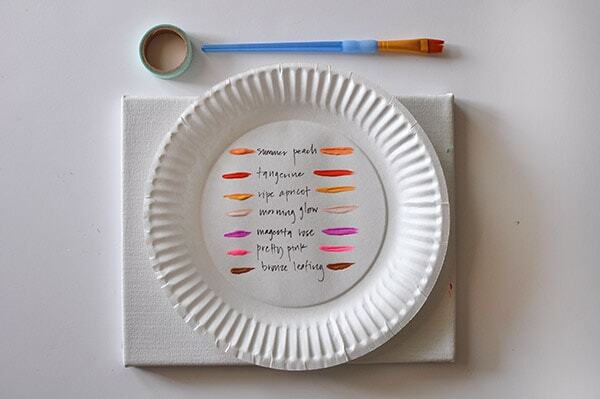 This is lovely and so achievable for the artistically challenged as well. The little metallic touches are just beautiful. Well, I couldn’t ask for a more wonderful comment! Thanks so much, Julie. Have a great weekend. Ooh, that bronze foil paint is really nice! What type of paint did you use? Thanks so much for your question. I just added an amazon link to the supply list for the bronze paint I used! I’ve been really happy with the gold and bronze leafing paints for this brand. Oh My Gah…Thanks for this inspiration! I love it so much, I will have to create one for my room. The bronze foil made all the difference! 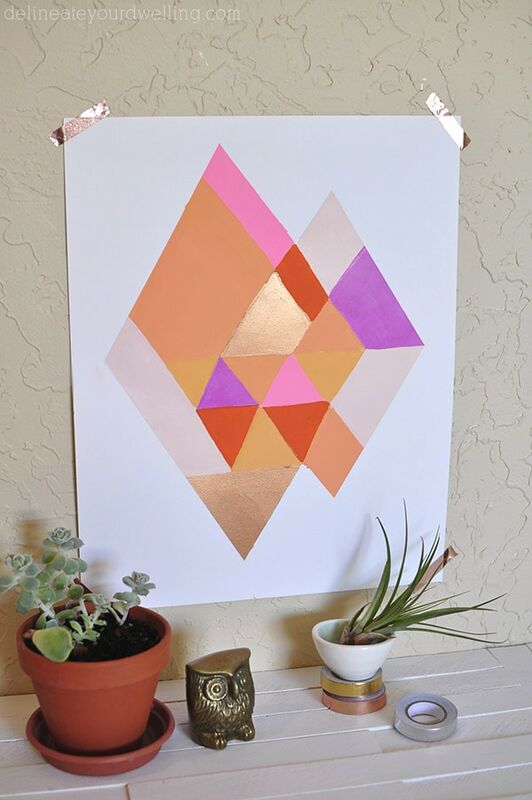 Easy project with a lot of impact; it can be used to bring chromatic cohesion to a room. I agree, bronze foil was my favorite part!